Tensions have been high in the long-disputed territory of Kashmir since the killing of Burhan Wani by Indian security forces in July 2016. Wani, 22 years old, was a commander with the Hizbul Mujahideen, considered the largest armed militant group in the Kashmir Valley. The group’s aim is to reunite Kashmir and Pakistan, forming one side of a conflict that has persisted since the partition of India and Pakistan in 1947. Wani’s funeral was followed by angry protests that were unprecedented in intensity and range. Indian government reprisals have left nearly 100 civilians dead and thousands more injured. In India, the widely circulated images of slogan-chanting, stone-throwing crowds, army reinforcements, cordons, curfews, pellet injuries, body bags and funerals have been mostly seen as inevitable in the fight against Kashmiri “militancy”. Often referred to as the “poster boy” of Kashmiri militancy, Wani attracted the Indian government’s attention with bold pictures that revealed, even flaunted, his identity. A spate of online videos were also seen as a driving force behind the recruitment of close to 100 youths from the region to the Hizbul in recent years. Wani joined the ranks of the Hizbul in the months following the 2010 anti-India protests in Kashmir. The dramatic growth in the numbers of locally recruited people to militant groups in the wake of police brutality and protester deaths at the time is often linked to Wani’s videos, in which he called upon young people to resist Indian rule. In the midst of the jingoism and nationalist frenzy that followed Wani’s death – not just in Kashmir but in India and Pakistan – it is important to recognise not just the few hundred youth whom Wani may have motivated to violence but also the tens of thousands of people who mourned for him in Kashmir, most of whom were unlikely to take up arms. What was it about Wani that so captured the imagination of the Kashmiri populace, particularly its youth? The violent unrest that followed in his death have raised legitimate concerns about a possible resurgence of armed militancy in the valley. But his huge following is also linked to a quite different, but possibly decisive, moment in the history of Kashmiri “militancy”. Undoubtedly for most in Kashmir, Wani’s death and the subsequent unrest in the valley resonated with the long struggle for azadi, or freedom, informed by collective memories of centuries-long exploitation and oppression at the hands of successive foreign rulers. India’s post-1947 claim to Muslim-majority Kashmir is seen as one more phase of colonial occupation, based on an unconfirmed instrument of accession and the promise of a plebiscite in 1947 that has never been fulfilled. Nevertheless “militancy” in Kashmir has taken on dimensions significantly altered from the violent insurgency of the 1990s. Deep structural changes to Kashmiri society in the almost decade-long lull that followed the bloodshed of the 1990s, became manifest most vividly with televised images of angry processions that thronged the valley in 2010 of stone-throwing, but otherwise unarmed, youth. 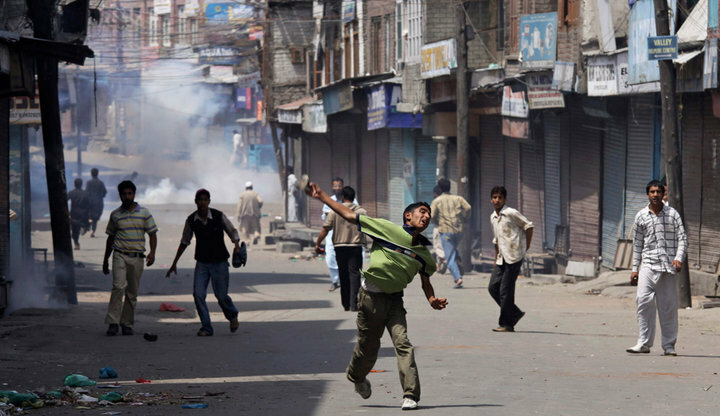 Several factors have influenced Kashmir’s new – and mostly unarmed – “militancy”. 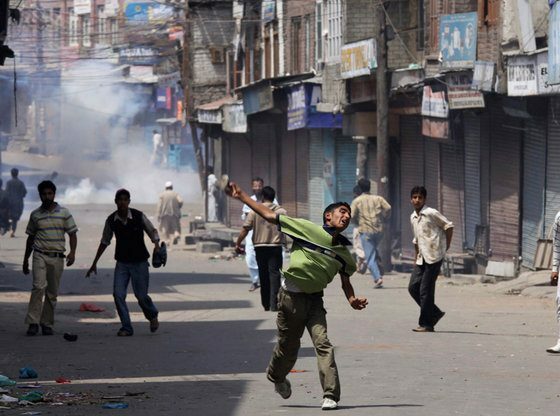 Kashmiri youth, including those involved in both violent and non-violent anti-India protests, contend today with uneven globalisation, Indian mass media, online connectivity, modern education, and at the same time, continuing militarisation and surveillance, social insulation, alienation, and the widening sphere of influence of orthodox Islam. Identity, nationalism, and shifting modes of resistance relate now not only to the physical invasion of private spaces or the rising numbers of the highly educated and underemployed, but also, to virtual surveillance and the closure of channels of even civil discourse for young people in Kashmir. In the wake of Wani’s killing, Indian state reasoning for prolonged curfews over not just physical spaces but also over vital channels of communication (local newspapers, television channels, Facebook, mobile messaging services) has been that they can be used to spread rumours, hate messages, even violence. The argument, in other words, is that surveillance and banning social media is important to maintain peace in Kashmir. It is important to remember that for those forced to live veritably on the margins of their own homeland, access to these digital spaces has come to be associated with power, voice and reach. This relates to a discursive turn to the resistance in Kashmir, and perhaps, hopes of winning by peaceful means. There is today a restless, educated generation in Kashmir – most of whom were born after the armed militancy of the nineties – that has grown up in intimate familiarity with the use of digital technologies. As point of comparison, the 2011 revolution in Egypt was not a “Twitter revolution”, but the result of a highly stratified society, where real wages had been decreasing more than 20 years but strikes were forbidden, and where state repression was rising and poverty was increasing. By the same token, in Kashmir, social media discourses – no matter how radical or outside the political mainstream of acceptable ideas – can hardly be seen as the cause of violence. Articulations of azadi among Kashmiri youth are related to their experiences of living under the Indian nation-state, its military presence in Kashmir, and its proposed citizenship. What people mean by azadi, then, is often fractured along lines of age, gender, class and locality. There are significant differences between the aspirations of students in government schools and private schools, of those already in universities, those living in the up-market, residential areas of the capital Srinagar city, versus those growing up in its old city areas or remote rural districts. It is within this context that what Burhan Wani came to symbolise for many in Kashmir can be understood. His visible persona of openly articulated rebellion – mostly over digital platforms – resonated not only for the few on the brink of armed violence, but also for thousands of educated, alienated, angry young people who wanted to express themselves, and also be heard. Their perspectives must be acknowledged as the more powerful “new militancy” in Kashmir today – dealing as they do in words not guns, resisting without violence. Chitralekha Dhamija is an Assistant Professor at Jawaharlal Nehru University. This article was first published on The Conversation and can be found here. Image credit: CC by Kashmir Global/Flickr.